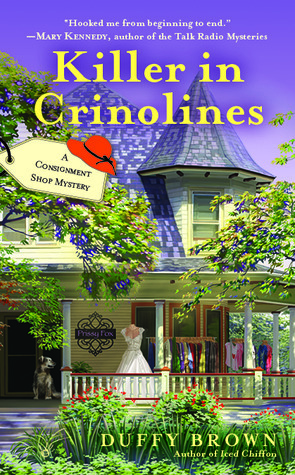 This is the second book in the Consignment Shop Mystery series by Duffy Brown. I am really enjoying this series so far. I love the sleuth Reagan Summerside and her sidekick/aunt KiKi. This is a mystery with a lot of humor. Aunt Kiki quotes Cher when confronted with a variety of circumstances. Reagan comes up against Walker Boone, her ex-husband’s divorce attorney throughout her attempts to clear the name of her friend Chantilly, who has been accused of murder. The romantic tension between Boone and Reagan is very well done. The mystery takes you all around Savannah, Georgia visiting eateries and colorful characters, including a baker who bakes “interesting” cookies, an alligator, and a gangster named Pillsbury. The only criticism I would have is that the dialog involving the gang members doesn’t feel realistic, but that was a minor flaw in an otherwise enjoyable, fun mystery.